The theory was first proposed by two authors working independently: Hans Kuhn and Maurits Gysseling, whose proposal included research indicating that another language may have existed somewhere in between Germanic and Celtic in the Belgian region. The term Nordwestblock itself was coined by Hans Kuhn, who considered the inhabitants of the area neither Germanic nor Celtic and so attributed it to the people a distinct ethnicity or culture up to the Iron Age. Concerning the language spoken by the Iron Age Nordwestblock population, Kuhn speculated on linguistic affinity to the Venetic language, other hypotheses connect the Northwestblock with the Raetic ("Tyrsenian") or generic Centum Indo-European (Illyrian, "Old European"). Gysseling suspected an intermediate Belgian language between Germanic and Celtic, that might have been affiliated to Italic. According to Luc van Durme, a Belgian linguist, toponymic evidence to a former Celtic presence in the Low Countries is nearly utterly absent. Kuhn noted that since Proto-Indo-European (PIE), /b/ was very rare, and since that PIE /b/, via Grimm's law, is the main source of regularly inherited /p/ in words in Germanic languages (except after fricatives such as *sp-), the many words with /p/ occurring must have some other language as source. Similarly, in Celtic, PIE /p/ disappeared and in regularly-inherited words did not reappear in p-Celtic languages except as a result of proto-Celtic *kʷ becoming *p. All that taken together means that any word starting with a /p/ in a Germanic language that is not evidently borrowed from either Latin or a p-Celtic language, such as Gaulish, must be a loan from another language. Kuhn ascribes those words to the Nordwestblock language. Linguist Peter Schrijver speculates on the reminiscent lexical and typological features of the region from an unknown substrate whose linguistic influences may have influenced the historical development of the (Romance and Germanic) languages of the region. He assumes the pre-existence of pre-Indo-European languages linked to the archeological Linear Pottery culture and to a family of languages featuring complex verbs, of which the Northwest Caucasian languages might have been the sole survivors. Although assumed to have left traces within all other Indo-European languages as well, its influence would have been especially strong on Celtic languages originating north of the Alps and on the region including Belgium and the Rhineland. It is uncertain when Germanic began to gain a foothold in the area. The Nordwestblock region north of the Rhine is traditionally conceived as belonging to the realms of the Northern Bronze Age, with the Harpstedt Iron Age generally assumed to represent the Germanic precedents west of the Jastorf culture. The general development converged with the emergence of Germanic within other previously Northern Bronze Age regions to the east, maybe also involving a certain degree of Germanic cultural diffusion. The local continuity of the Dutch areas was not substantially affected by pre-Roman or Celtic immigration. 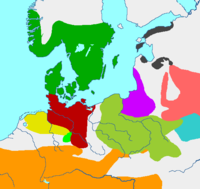 From about the 1st century CE, that region saw the development of the "Weser-Rhine" group of West Germanic dialects which gave rise to Old Frankish from the 4th century. The issue still remains unresolved and so far no conclusive evidence has been forwarded to support any alternative. Mallory considers the issue a salutary reminder that some anonymous linguistic groups that do not fully obey the current classification may have survived to the beginning of historical records. The archaeological case for the Nordwestgroup hypothesis makes reference to a time as early as 3000 BCE. The following prehistoric cultures have been attributed to the region and are compatible with but do not necessarily prove the Nordwestblock hypothesis. The Bell Beaker culture (2700–2100 BCE) is thought to originate from the same geographic area, as early stages of the culture apparently derived from early Corded Ware culture elements, with the Netherlands/Rhineland region as probably the most widely accepted site of origin (J. P. Mallory, EIEC p. 53). The Bell Beaker culture locally developed into the Bronze Age Barbed Wire Beaker culture (2100–1800 BCE). In the 2nd millennium BCE, the region was at the boundary between the Atlantic and Nordic horizons, split up in a northern and a southern region, roughly divided by the course of the Rhine. To the north emerged the Elp culture (1800-800 BCE), featuring an initial tumulus phase showing a close relationship to other Northern European tumulus groups (sharing pottery of low quality: Kümmerkeramik) and a subsequent smooth local transformation to the Urnfield culture (1200–800 BCE). The southern region became dominated by the Hilversum culture (1800–800 BCE), which apparently inherited the previous Barbed Wire Beaker cultural ties with Britain. From 800 BCE onward, the area was influenced by the Celtic Hallstatt culture. The current view in the Netherlands holds that subsequent Iron Age innovations did not involve substantial Celtic intrusions but featured a local development from Bronze Age culture. In the final centuries BCE, areas formerly occupied by the Elp culture emerge as the probably-Germanic Harpstedt culture west of the Germanic Jastorf culture, and the southern parts become assimilated to the Celtic La Tène culture, as is consistent with Julius Caesar's account of the Rhine forming the boundary between Celtic and Germanic tribes. Later, the Roman retreat resulted in the disappearance of imported products like ceramics and coins and a return to virtually-unchanged local Iron Age production methods. To the north, people continued to live in the same three-aisled farmhouse, and to the east, completely-new types of buildings arose. More to the south, in Belgium, archaeological results of the period point to immigration from the north. With the onset of historical records (Tacitus, 1st century), the area was generally called the border region between Celtic (Gaulish) and Germanic influence. Tribes located in the area include the Batavians, Belgae, Chatti, Hermunduri, Cheruscii, Salii, Sicambri, Tencteri and Usipetes or Usipii. Caesar took the course of the Rhine to be the boundary between Gauls and Germans (Germanic people) but also mentioned that a large part of the Belgae had ancestry from east of the Rhine and that one part were even known collectively as "Germani" (the so-called "Germani cisrhenani"). The Belgae were therefore considered Gaulish (the Usipetes Germanic etc.) because of their position with respect to the Rhine, and not in the modern linguistic sense of the terms. Some of those tribes would later join the Frankish confederation. ^ Peter Schrijver. Keltisch en de buren: 9000 jaar taalcontact, University of Utrecht, March 2007. ^ Leo Verhart. Op Zoek naar de Kelten, Nieuwe archeologische ontdekkingen tussen Noordzee en Rijn, 2006, p67. ISBN 90-5345-303-2. ^ J. H. F. Bloemers & T. van Dorp. Pre-en Protohistorie van de Lage Landen. De Haan/Open Universiteit, 1991, pp. 329–338, ISBN 90-269-4448-9, NUGI 644. This page was last edited on 18 February 2019, at 18:42 (UTC).